for part 1, see April 10th. The night of terror yielded to Dawn of the Dread. 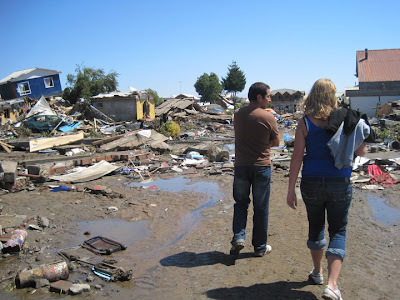 Hours after the last maremoto rolled over Dichato, with multiple reassurances that there would be no more quake-generated waves, ABC/PM made their way slowly through the devastated village streets. Where Friday they had left their rented cabin with all their belongings, they found only a foundation. But they had lost only their vacation possessions; the residents of Dichato had lost all that they knew. You have to look back like 2 posts for the pictures and like 4 posts for the complete story. I'm waiting on an e-mail from Amanda, and I'll let you know the status of the shirts once I get that. Thanks soooo much again for your interest, I'll keep you up-to-date on what's going on! Amanda, Ben, and Carissa have been raised with Christ, and were providentially spared from the destructive forces that struck Dichato. May they, as we, keep seeking the things that are above, where Christ is, seated at the right hand of God.